This driveway gate Cypress TX area was exactly what the homeowners asked for! The homeowners called us and asked for us to install a gate on their driveway so the kids would be able to play safely inside their courtyard area without having to worry about them getting too close to the road or anyone being able to get to them when they are playing in the yard. We were able to custom fabricate the driveway gate and automate it with a LiftMaster single swing gate operator. Once the operator is in place and on the gate cannot be moved manually .Our automated gate packages usually include two remote transmitters and a wireless keypad. We were able to design and install this gate that the homeowner absolutely loves! 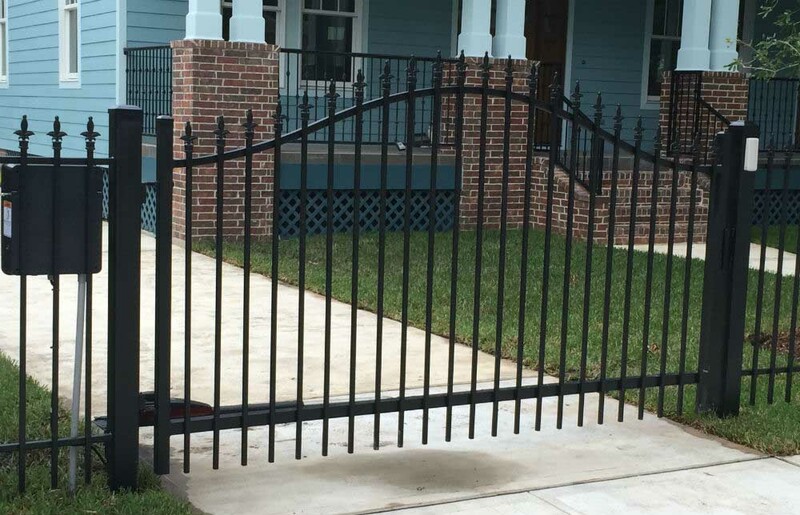 As far as driveway gates go this iron construction is as secure as it gets. The Liftmaster gate openers allows for the ultimate convenience! The gate opener feature can be operated from a vehicle and from inside the home. At Houston Sentry Garage Door & Gate we take pride in all the projects we accept. This driveway gate in the Cypress area is a great example. If you are looking for the best. At a fair price from a company with a hard earned reputation we invite you to check out our BBB A+ Rating and then call to set up a free consultation today!